Dylan Lienhard wrote me a novel about his tattoo based on a novel. He explained that when he was a kid his dad used to read The Hobbit and The Lord of the Rings to him and his brothers before bed. His dad’s level of geekiness wasn’t realized until later, but Dylan always admired his ability to read and write Elvish. For awhile Dylan knew that he wanted a dragon tattoo, but could never find a design that he liked enough to ink on his body, that is until he remembered seeing a simple sketch of Smaug, the dragon from The Hobbit. The challenge in getting the tattoo was to find and verify the authenticity of the drawing of Smaug that Dylan had once seen. 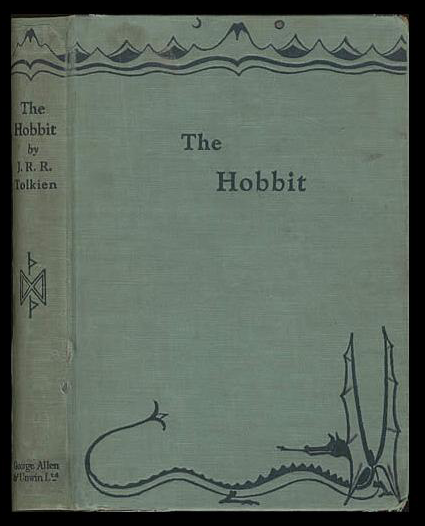 After much searching through Tolkien drawn maps and book covers, he finally found the design, which Tolkien himself drew, under the dust jacket and on the actual hardcover of the first edition of The Hobbit. 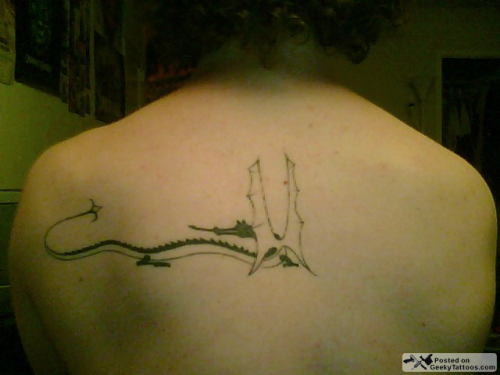 His classic dragon was inked just around the corner from me at Braindrops here in San Francisco. Tagged with back, Braindrops, dragon, Lord of the Rings, LOTR. Awesome. I'm totally stealing this idea!